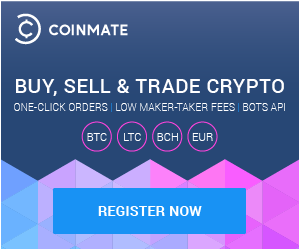 After 6 months of hard work, we are ready to announce a new version 1.2 of the CoinMate.io bitcoin trading platform replacing the current v1.1 beta. Improved BTC withdrawal process, and a flat 0.0001 bitcoin transaction fee. No fees for bitcoin deposits. The most fundamental change will be transition of the entire portal system currency from USD to EUR. This means that all balances and all transaction history will be converted into Euros using exchange rate http://finance.yahoo.com/q?s=eurusd=x at the time of the new version deployment at 5pm GMT Sunday 19 July 2015 (using the spot exchange rate of Yahoo finance). We will retain all transaction history in USD before we make the switch. 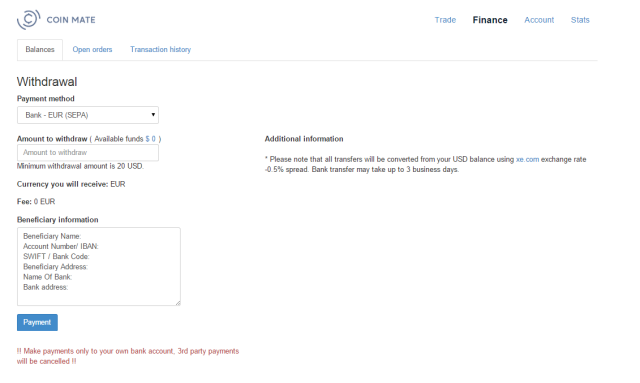 Clients who require their USD transaction history can request it via our support team. If you withdraw your USD account balance or convert your USD account balance into Bitcoin before this date, your account balance will not be otherwise influenced. If you will have an USD balance at the time of the transition, it will be favourably converted into EUR using the spot rate. Trading will thereafter take place using EUR/BTC exchange rates. Bitcoin balances will remain the same as before the transition. The EUR, CZK and PLN bank Deposit and Withdrawal methods will remain intact, OKPay deposits and withdrawals will be newly processed in Euro. During the month of August we will also introduce new funding method Sofort (instant bank deposit supported in 13 EU countries) and new instant deposit and withdrawal method MoneyPolo (MoneyPolo allows cash deposits and cash withdrawals in 150 countries of the world and offers a prepaid card) . Please note that CoinMate.io trading portal will be unavailable from 5pm GMT until midnight Sunday 19 July 2015 during the deployment of the new version. We hope you will enjoy new CoinMate providing even smoother trading experience and favourable rates for speculative trading. In case you have any questions, please contact our Support.